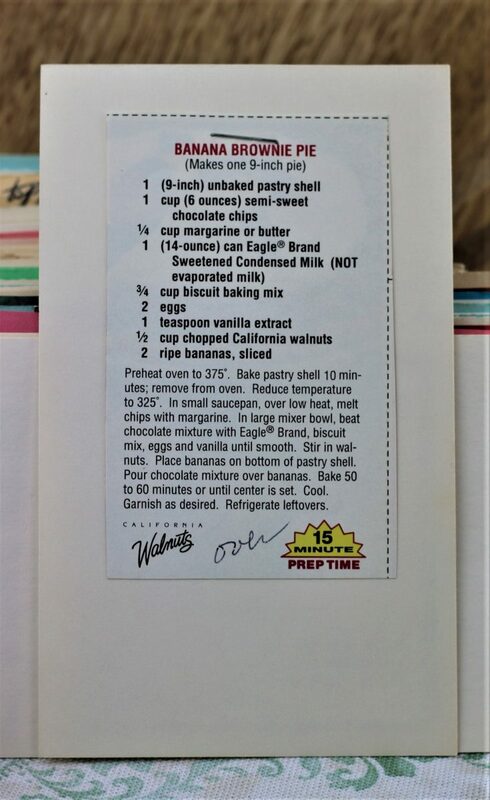 Front of the recipe card for Banana Brownie Pie. There is a notation to turn the card over but it’s glued to the card so I cannot see what is on the back of the actual recipe. 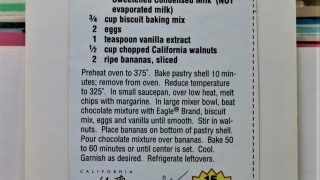 There are lots of fun recipes to read in the box this recipe for Banana Brownie Pie was with. Use the links below to view other recipes similar to this Banana Brownie Pie recipe. If you make this Banana Brownie Pie recipe, please share your photos and comments below! Preheat oven to 375°. Bake pastry shell 10 minutes; remove from oven. In small saucepan, over low heat, melt chips with margarine. In large mixer bowl, beat chocolate mixture with Eagle Brand, biscuit mix, eggs and vanilla until smooth. Place bananas on bottom of pastry shell. Pour chocolate mixture over bananas. Bake 50 to 60 minutes or until center is set.